The nerve agent that poisoned two people in Amesbury was contained in a perfume bottle, the brother of one of the victims has said. Matthew Rowley said his brother Charlie, who is seriously ill in hospital, told him he had picked up the perfume bottle. The Metropolitan Police, which is leading the investigation, refused to confirm the claim. Previously the force has said only that it was found in a "small bottle". Charlie Rowley and his partner, Dawn Sturgess, were exposed to the nerve agent on 30 June. A murder investigation was launched after Ms Sturgess died on 8 July. Investigators believe the incident is linked to the Novichok poisoning of former Russian spy Sergei Skripal and his daughter Yulia in Salisbury on 4 March. On Friday, police reiterated advice from Public Health England for people in the area not to pick up strange items - including cosmetics. 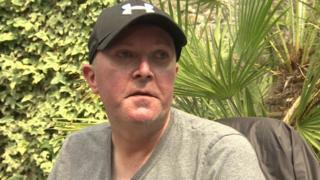 Matthew Rowley told BBC News he was still upset about his brother's condition after speaking to him on the telephone. He said Charlie Rowley was "absolutely not the brother I know" though he said he was now eating solid food. BBC home affairs correspondent Danny Shaw said the information about the bottle could be a significant clue for investigators trying to isolate the source of the nerve agent and identify who administered it. "Where did it come from, where was it bought, is it something that is very rare, is it something that's unusual, is it something that was bought in a particular shop at a particular time?" he said. "That could be absolutely vital for the investigation to find out who was responsible for the attack on the Skripals and also for the latest attack."